Stratumseind is the place to be if you want to experience the nightlife in Eindhoven. 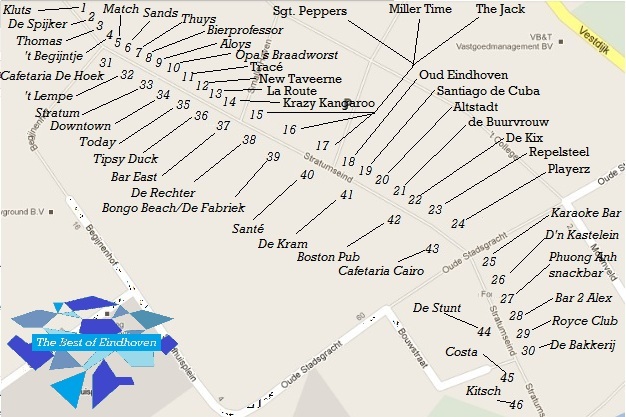 There are over 40 bars in this street. 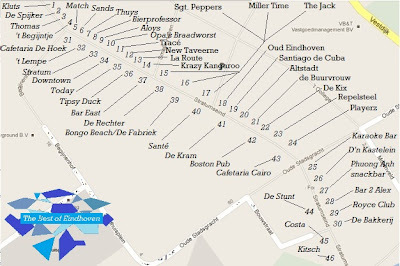 Each bar has its own public and music. Saturday night and Friday night the pubs are open till 04:00. Thursday night the pubs are open till 02:00. This night is also known as student night. Stratumseind hasn't always been a nightlife district. It used to be a street with industry companies and small businesses, like barbers and butchers. In the seventies, these shops were replaced by bars and pubs. 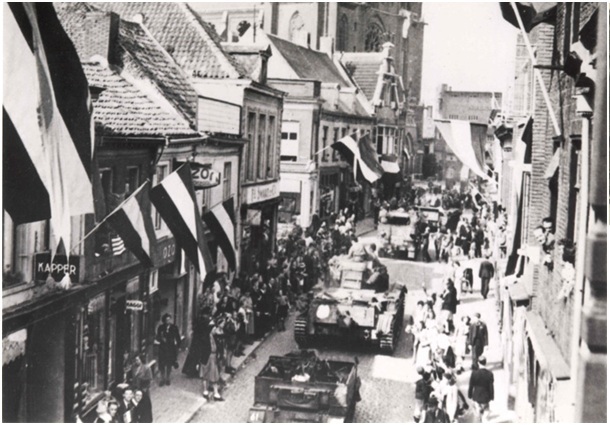 Today, we will give you information about the history of the first part of Stratumseind (1-14 & 31-39 on the map) . We will start with a view on the Catharina Church with the Catharina square. On the first picture you can see that there used to be a rectory next to the church. Unfortunately, this rectory has been demolished. The square had been broaden. 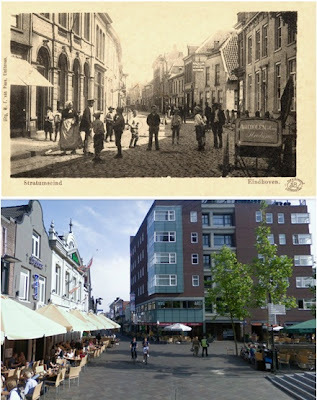 Therefore, nowadays stratumseind starts with Cafetaria de Hoek (ground floor of the flat in the middle). The left picture was taken in 1963. Nowadays, the two buildings on the left are known as cafe 'De Spijker' (The Nail). In these two buildings, there used to be a little hardware store with the same name. The people of Eindhoven could buy their nails, screw and bolts here. In 1878, Thomas van Dijck, director of a timber factory, bought the beautiful white building in the middle of the picture. He rebuilt it into a music hall annex cafe and he sold it to the male voice choir of Eindhoven in 1923. Later, the building has been used as a furniture shop, a textile shop, a shoe shop and finally as a kebab shop. 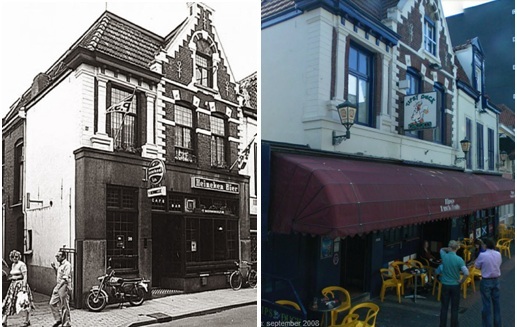 In 1995, after the renovation, Cafe Meneer van Dijck (Mister van Dijck) opened his doors. But I assume the owner prefers the first name of Mister van Dijck, because nowadays the cafe is known as the Thomas. Café Thuys used to be the little book shop Smaling. 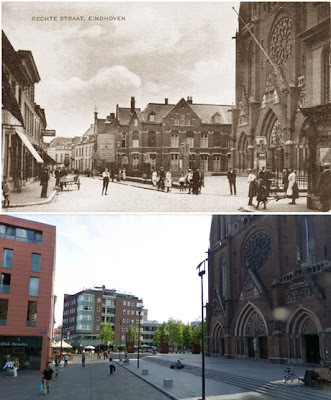 The left picture was taken in 1939. 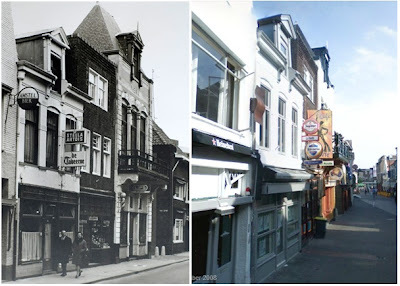 The left picture was taken in 1976 when the Tipsy Duck was named 't Bierwinkeltje (the little beer shop). Cafe 't Bierwinkeltje used to be a butchery. The left picture was taken in 1968. 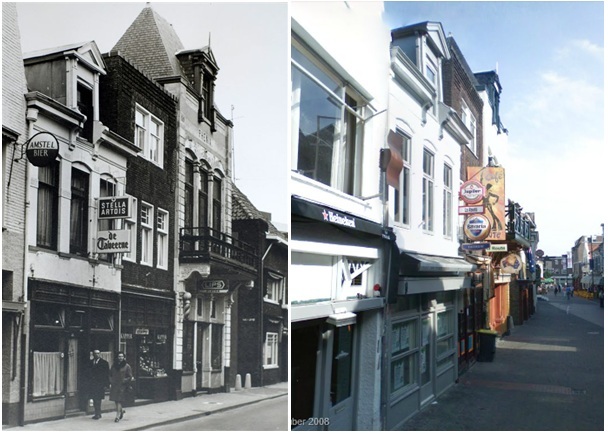 You can see that Café Tavernee already existed in 1968. Next to Café Tavernee there was a little barber and a hardware store. The last picture was taken in 1910. Here, the buildings on the right side are still intact. 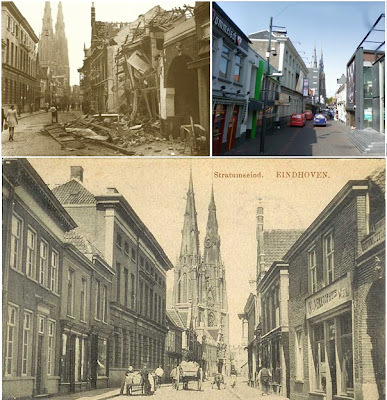 In 1944 these buildings were bombed (first picture). Nowadays, you can find cafe the Jack and cafe Miller Time here (second picture). On the left side, you see a big grey building. This is the justice building of stratumseind. You can still see the word Justicia on this building. It was inaugurated in 1843. Behind the building there are still residues of the former prison. This justice building used to be cafe de Rechter (cafe the Judge). Unfortunately, the building is empty know. 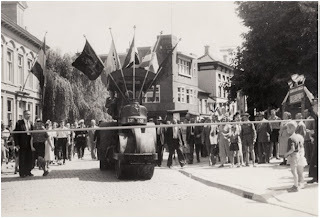 Yes, a new asphalted road was a reason to give a big party in 1953! Want to see more historical pictures of Eindhoven?